The former Ireland international says the role is "for a gillie." Image: Virgin Media Sport Twitter Page. NIALL QUINN HAS ruled himself out of applying to succeed John Delaney as Chief Executive Officer of the Football Association of Ireland at present. Delaney stepped down from the position on Saturday to take up a new role as Executive Vice-President within the Association. Chief Operating Officer Rea Walshe has been appointed as interim CEO by the FAI board while the recruitment process begins to fill the role permanently. But the former Ireland international, businessman and ex-chairman of Sunderland insists he will not be putting himself forward for the role, and has criticised the outline of the job description. “Under absolutely no circumstances will I be applying for the job given the current remit of where this job sits,” he said on Virgin Media Sport. I don’t think it reads as a CEO role at all, I think it reads as half a CEO role and anyone going in there will have a huge shadow over them because the departing CEO hasn’t departed at all and it would make life very difficult. “Quite frankly, I think it’s a little bit of a charade, given the scrutiny that was in place over the last week. “The rush of the appointment, the unanimous decision of the board to tell us all late on a Saturday night in the middle of some serious scrutiny on the CEO during that time that this was best for the Aassociation and it was a great move and everybody should back it. “We’re not buying it, I’m not buying it and I think that’s an ill-conceived decision that needs to be looked at again in my opinion. Prior to the news of Delaney stepping down as CEO, the 51-year-old came under significant pressure after revelations of a €100,000 loan provided to the FAI two years ago came to light. The Sunday Times reported that Delaney had provided a loan to the FAI due to a cashflow issue arising within the association. Delaney claimed that the money was repaid in full in June 2017, and that it was the only occasion on which he issued the association with a loan. Email “'Anyone going in there will have a huge shadow over them' - Niall Quinn rules out applying for FAI CEO job”. 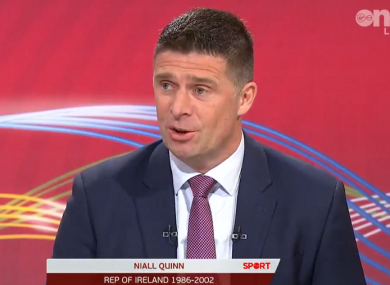 Feedback on “'Anyone going in there will have a huge shadow over them' - Niall Quinn rules out applying for FAI CEO job”.